Review: Fairy Fencer F – Fencing Away to Save the Fairies! -Loot drops seem far and few, but doing side quests from the pub makes up for this. -The plot at times loses its focus and its charm, but does regain it a bit down the road. -World shaping for many can be confusing and tedious when figuring out what to do. Ever wondered what would happen when the publisher of Prinny, Hyperdimension Neptunia and Disgaea can do with a new IP? You get something as amusing as Fairy Fencer F, which follows the story of our overly hungry, grumpy, and whiny as well as comical lead character known as Fang. Fang is one that has had the mishap of becoming a Fencer or rather a hero, but has no care to do it, but how did he become one? His luck got the best of him when he pulled out a magical sword from within the ground, much like King Arthur did with Excalibur, and let it be told; he gained a fairy. Once he removed the sword his new traveling partner Eryn comes aboard, with her sense of humour and bubbly attitude, it’s only a surprise Fang hasn’t left her behind to wonder endlessly or just vanish. Taking her along, Fang begins his journey to help Eryn unseal the Goddess and bring world peace upon the world. Following the well known Compile Heart style we saw with past titles such as Hyperdimension Neptunia and Hyperdimension Neptunia PP, we see a lot of humour, but unfortunately the sexual innuendos that come out full force. This is only one of the small underlying issues though, but this does not take away the humour and or the silliness that made this game just a bit more than just a genuine adventure. The game is downright hysterical and for anime fans; comical through and through. Carrying forth through the title, players will easily be able to see how each of the heroes that join the party come across with their own unique fairies. Personally, the game is enjoyable because of the laid back and silly conversations that take place, in many ways it reminds me of several anime titles I loved bunched into one, but their names won’t be stated her. Much like a few of Compile Heart and their past titles, this one easily could adapt itself to their other franchise (Hyperdimension Neptunia), and speculatively been designed to use that system on purpose, but it works and it works well. 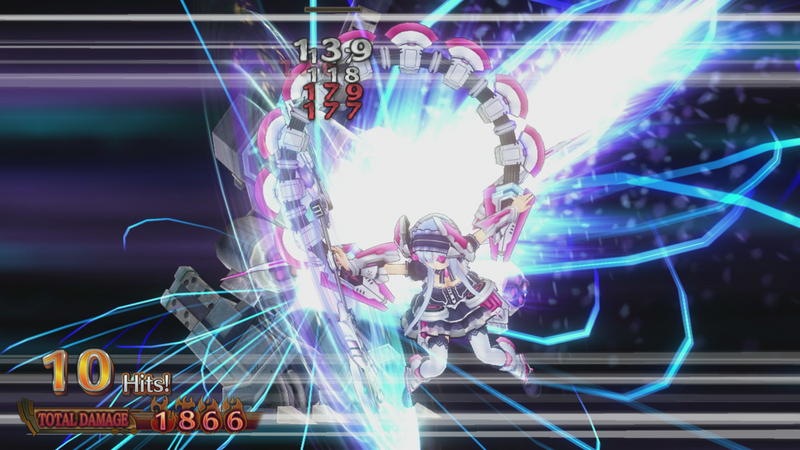 In Fairy Fencer F, players will be able to use the new combat system that we witnessed in Hyperdimension Re;birth 1, which allows players to get multiple targets into an attack range, and do so with simple, but slightly complex combat menus. One of the many things that was rather amusing about this games combat system was the uniqueness in going between ‘tension’, which helps players ‘Fairize’ (think Hyperdimensions HD mode for Neptunia and her friends) and in turn, deal more damage. This is something that will make players, much like myself, save up as much tension and SP as possible and go to town on enemies. Unfortunately, this does not always work, and can easily upset players since the difficulty of the title is a mere joke in the beginning compared to how it plays out later into the game. The goal is simple, however; clear dungeons, beat the bad guys, and ultimately earn a new Fury, which in turn helps save the Vile God or the Goddess. This becomes even more repetitive as players will find themselves using Fairies to work with. By “equipping” them in the equipment menu, I found myself quickly boosting my damage for Fang by spending all my points, literally, into his attack, combos, magic attack, and even his defenses. This is one of the few things I found disappointing and taking away the classic JRPG feel I’ve come so accustomed to, but they make it work and very well. Once players have gone through the combat system, which is quickly explained as well as taught, players will be clobbered in tutorials. These tutorials will describe everything from leveling, combat, dungeons, boss fights, character interactions, what vendors do as well as how, clear down to how world shaping works. Some of these tutorials seem very misplaced and honestly unwarranted. The one that was the most useful was what we will discuss next; The Vile God and the Goddess. As many of you know by now, Fang is on the quest to revive the Goddess and or the Vile God, which in turn, brings about massive forces to once more walk the planet. It’s not as easy as it sounds. Players will need to clear the dungeons, as stated before, which in turn gives them fairies to use in order to “fuse” them with a fury that has the Vile God and the Goddess in a sleeping state. 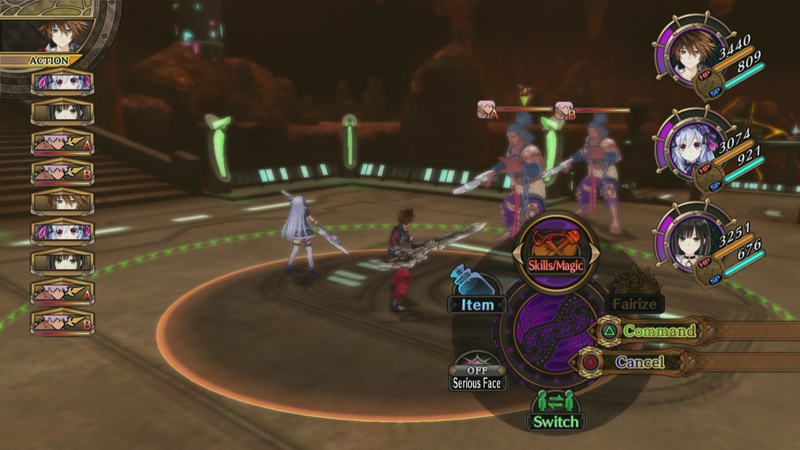 As these weapons are removed, they will initiate a fight, which includes a boss. Some of these bosses will be between five and ten levels higher than the player. This means you may not want to go unprepared and if you do, prepare to pay the price. Once the Fury’s encounter has been cleared, the weapon will affect the character that wears them with damage modifiers for certain elements, dungeon modifiers, but also, they do have a negative effect sometimes. There were instances I did find that shifting fairies around was for the best. The downside? Each of them have to be leveled as if they are an entirely new character, but luckily, only by equipping them. In return, fairies can be used in order to change how dungeons function. The most helpful one is the capability for higher loot drops, and lowered XP (experience) gain. Since XP is so easily gained that farming seems like a joke. Though some of them can make the game harder, which is a pleasant sign since the difficulty barely changes and leaves players hungering for more. For those wanting some fun, this is up your alley, but for those wanting a hard challenge could easily find themselves turned away unless they find the storyline as amusing as it is. The downside to some of these fairies is some of them will have something like this at C Rank “+1 Magic Attack” and gives your character of choice a “-1 Physical Attack”, these trade offs are unfortunate, but can easily be countered by finding what stat weights are best for the character that equips that fairy. With the combat system and dungeon crawling put aside, there was something unique that can be noted; the soundtrack. When playing the game I found myself rather amused by this as it easily resembled songs I’ve heard before, most of them having vocals of which some could compare to Skyrim’s ‘Dragonborn Comes’, while others turned my ears even more so that I could enjoy the J-Pop listing. The best soundtrack in there? The Fairize theme. I found myself constantly tapping my toes to it, which in turn demonstrates Nobuo Uematsu’s taste for capturing the games target audience. Within a few hours? I found myself humming many of the games songs and even themes, which leads to show that Nobuo Uematsu’s departure from Square-Enix in ways worked in his favor. 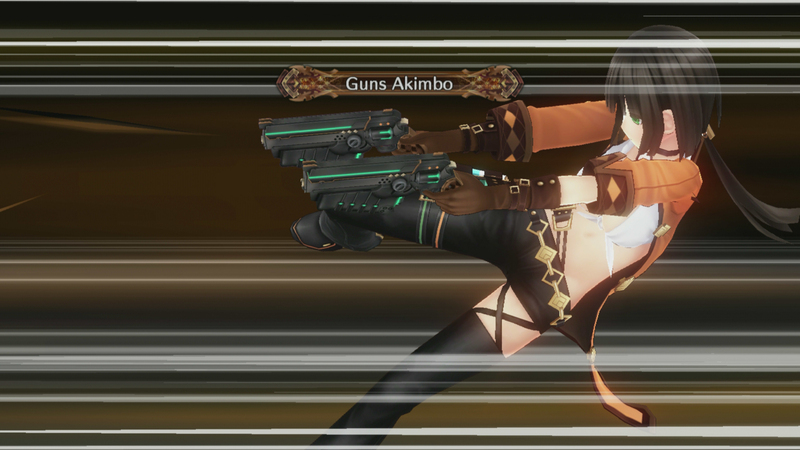 Though the game does take a hint from some of my favorite animes. The music changes over time in a ‘episodic’ type of format. This is a welcome change instead of hearing ‘Full Contact’ all the time, which alone, is a blessing since the song itself is amazing. With that being said, the game is a simple dungeon crawler with very anime like themes. With how well it has already been received, Compile Heart has already announced that a sequel is in the works at their pre-TGS show. What comes in Fairy Fender F: Advent Dark Force? The original Fairy Fencer F, but also the sequel. Where will it be going? To the PlayStation 4. This leaves room for many of us to question, will it make its way to the PlayStation Vita? 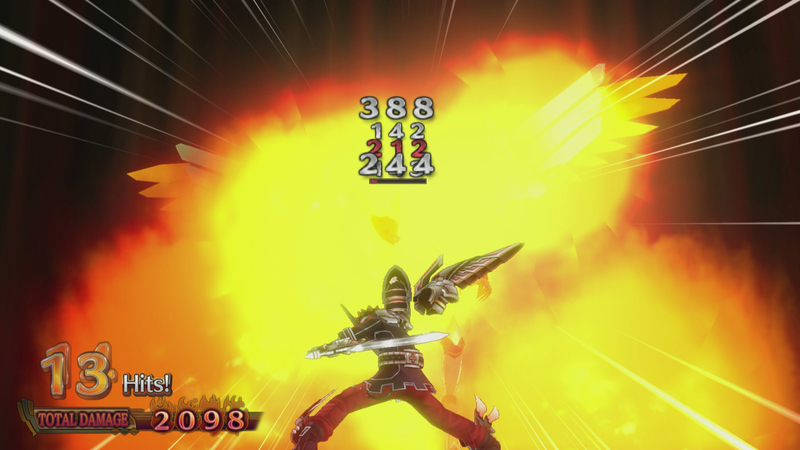 For now, the game is charming where it is, and makes itself right at home on the PlayStation 3. So what has Fairy Fencer F charmed itself into a score of? A wonderful 7 out of 10. I must say when I first came upon this game I was pretty interested in it and wondered how the game would turn out. As time went by however I found the main character to be the thing that pulled me away from wanting to continue the plot line altogether. I understand hes suppose to play a role as a comedic back board of sorts for the other secondary characters to make jabs at but after spending five hours plus with the game fang ended up being my Achilles heel which resulted in me stopping playing this ip. I have had similiar experiences with other compile hearts ips as well must be my old age starting to show I think. As always, we appreciate your feedback and support of our team. This game was one that when I played, we were looking to see how it would change up the JRPG scenario, and with what it did, all we can say is – it worked. With a rather refreshing system, the whole moving on the combat field and how to utilize characters made it interesting. We are hoping to see a rather more rounded story than in the first entry. However, with great IP changes, comes the risk of how their new systems work out. 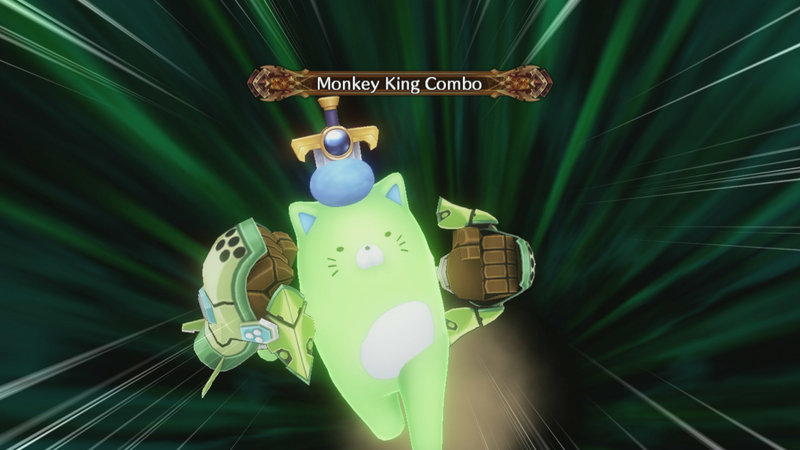 Though we understand the frustration with Fang’s development as that was one of my irritations with the game. We may end up revisiting it in the future to give it a second glance.